I picked up Kyndall from her first-ever extended stay with a puppy-sitter (4 nights with our old friend, the highly experienced LeAnn), and it was gratifying that Kyndall seemed happy to see me again. 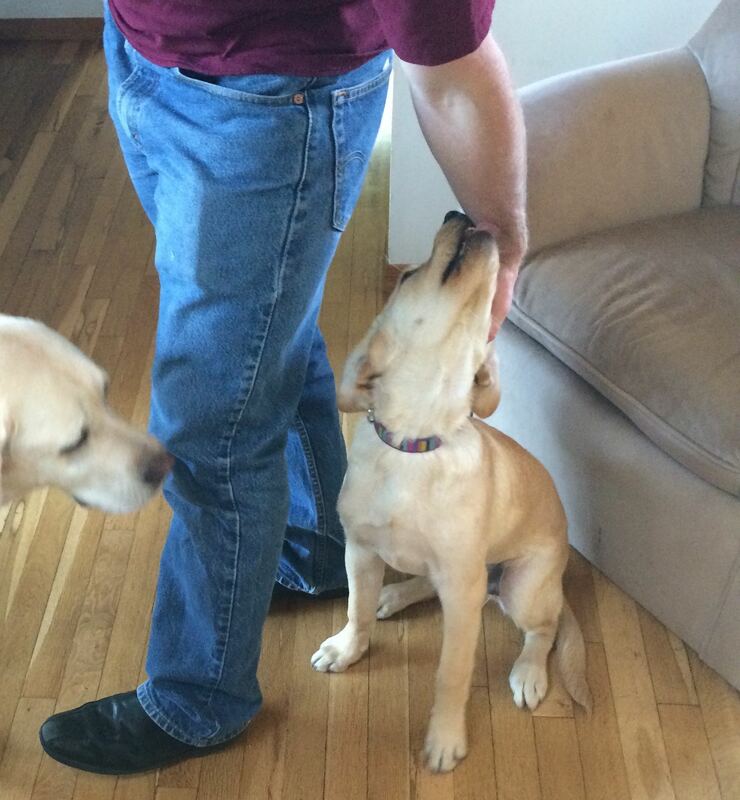 On the other hand, she’s happy to see everyone, particularly Tucker (see below). I’m not convinced she has imprinted and considers me to be her Mom. LeAnn’s impressions were reasonably assuring. She worked a lot on getting Kyndall to stay Down when commanded, and she reported that on Friday Kyndall remained in position for two hours straight at one point. (At other times, she comically stayed Down for only a few minutes before leaping up to chase her tail.) 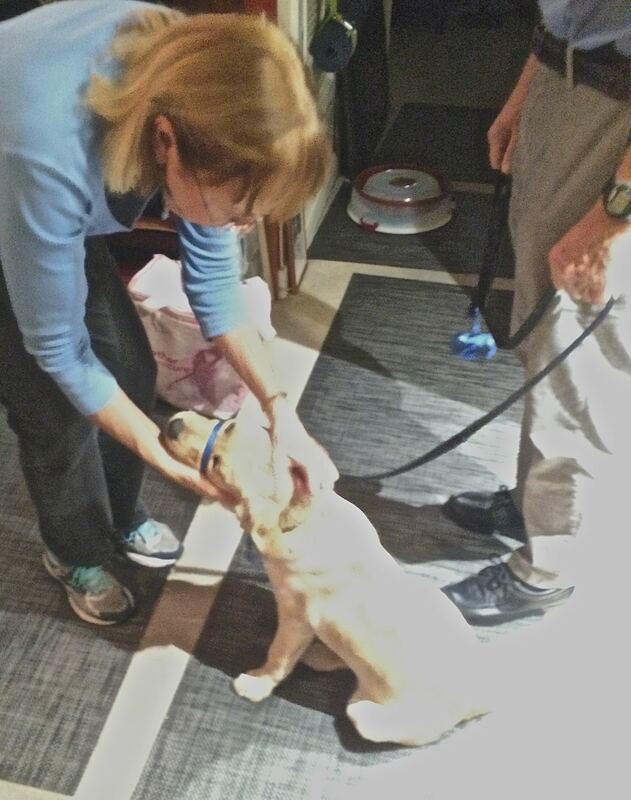 LeAnn also found her to be doing well at the Wait command and good at walking on her leash. LeAnn and her husband live with only one dog at the moment, Silky, whom they raised as a puppy for CCI. Despite initially being a “puppy on crack,” (LeAnn’s words), Silky somehow pulled it together to graduate and admirably serve someone. 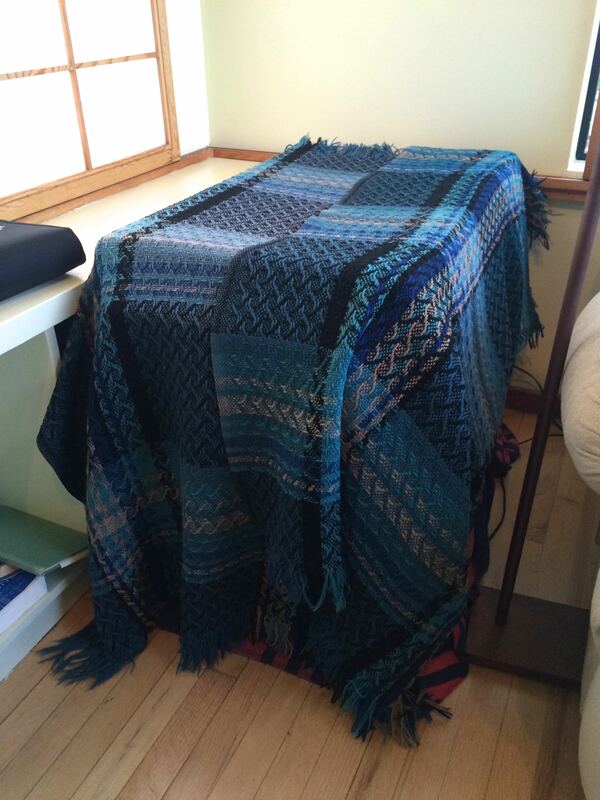 When that person died, LeAnn and her husband happily took her back. After I wrote the other day about Kyndall’s habit of waking at dawn, I got a very welcome suggestion from the person who’s raising Kyndall’s sister, Kihei. 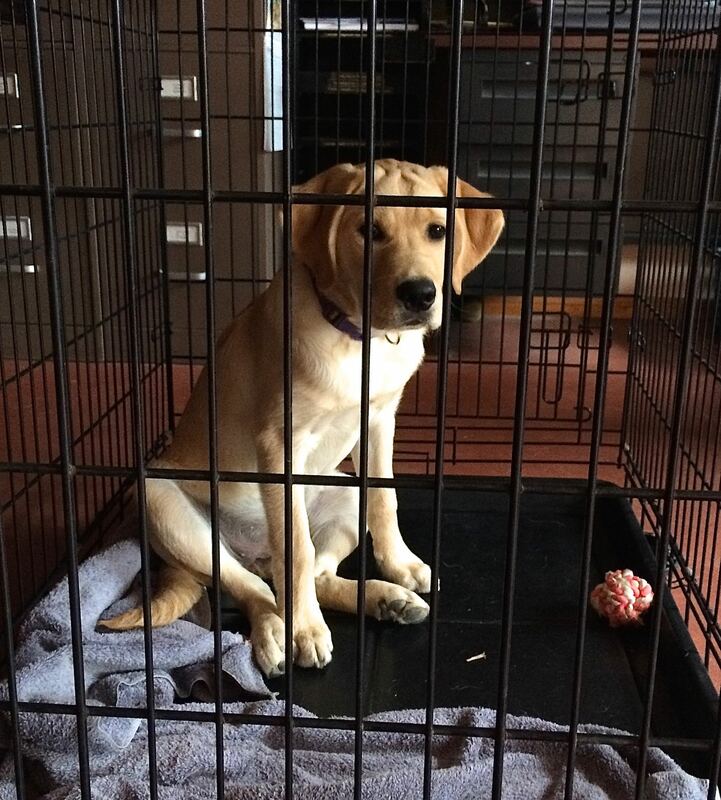 While Kihei also was early riser, her puppy-raiser described having luck at delaying the puppy’s wake-up time by covering her kennel to make it darker. The left side isn’t covered at all, so she certainly gets enough air to breathe. Sunday morning she slept until 5:45 a.m. — better than 5:30, we reasoned. This morning she kept quiet until almost 6. Better still, we exulted! We’ll have to wait until next weekend to continue trying to train her to sleep later, as while Steve and I go on a short trip, Kyndall will stay with LeAnn Buchanan, our original CCI puppy mentor. She’ll probably learn more from LeAnn than we could teach her in four weeks. And have more fun, to boot. 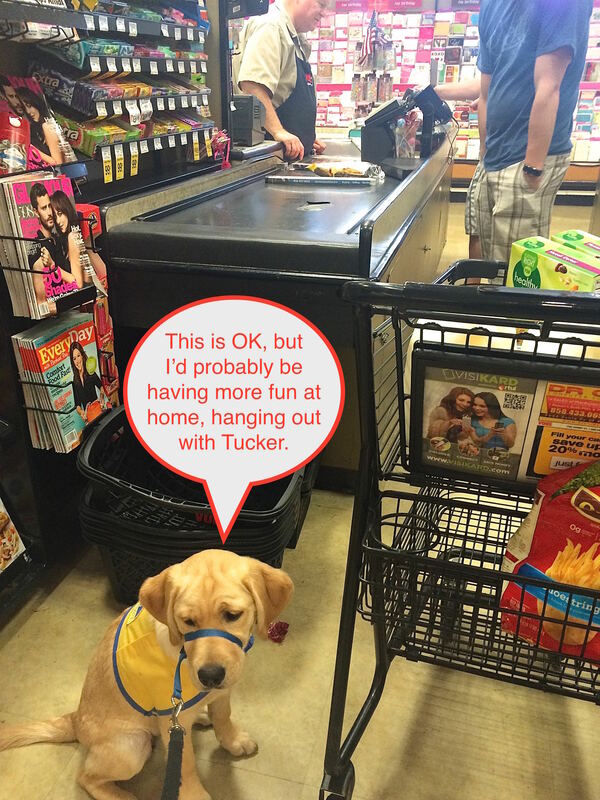 With Tucker, our first CCI puppy, I couldn’t wait until he was old enough to grocery-shop with me. CCI says puppies shouldn’t begin going on such excursions until they’re at least 4 months old and fully immunized, but I thought it would be the coolest thing imaginable to have an adorable puppy trotting beside me as I trolled the produce or dairy sections. I did leave her in her kennel in the van while I ran into the bagel store and the fish store (both 5-minute stops), and I was pleased that upon my return, the vehicle was silent — she hadn’t burst into mournful howls or frantic barks in my absence. 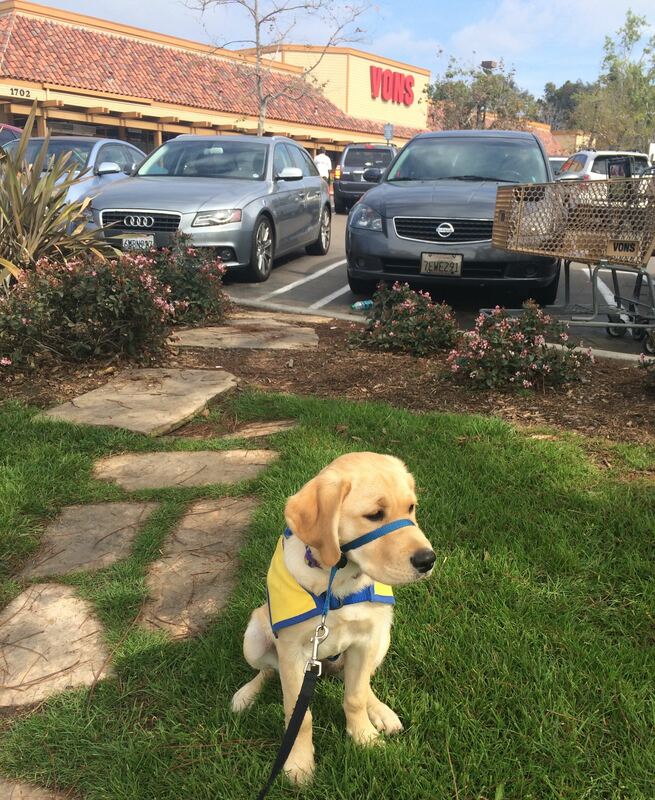 At Vons, we followed protocol and she peed (twice) in the parking lot, in response to my urging her to Hurry. Kyndall is excellent about Hurrying on command, on any kind of surface. Then we swept through the automatic doors into the thicket of Saturday morning shoppers. I only had 10 items to get, and I paid a lot of attention to Kyndall as we moved up and down the aisles. I ordered her to Sit frequently and rewarded her quick responses. She didn’t look stressed (no ears back or unusual behavior), but rather intrigued to be in this novel environment. The Worst Thing That Can Happen in a Grocery Store (a pooping accident), did not happen. But it did — on TWO occasions! — with Tucker, and scarred by that memory, I started to stress out when I couldn’t immediately find the bacon. (Why does Vons insist on reorganizing its stores so often?) I was certain Kyndall had pooped once early in the morning, but usually she does twice (even, incredibly, sometimes three times), and if there had been a second poop, I had somehow failed to notice it, making me afraid that she was overdue. But again, she had no toileting accidents of any sort, either at Vons or when we moved on to Sprouts. I can’t say her performance in either store was flawless. I caught her licking the bottom of the check stand at Vons, and she took a lunge or three at other shoppers (seeking to greet them). She wasn’t always in perfect position, next to and slightly behind my knee. But this was only the very beginning of the long and winding road to graduation. As such, it was a promising start. 14 days until Kyndall achieves perfection? We’ll all set our clocks forward 14 days from this evening (in the wee hours of March 8). I’m dreaming about it, not because I like the idea of losing an hour of sleep, but because I’m fantasizing that once we’re past it, life with Kyndall will be perfect. — She almost never has a toileting accident in the house; she sits by the door and whines when she needs to go out. — She has never vomited as a result of eating something she shouldn’t. — She follows us around the house and almost always races to us when we call her. — For the most part, she’s stopped trying to bite and chew on us. — She’s happy to lay by us or chill out in her kennel, playing with one of her toys. — Only rarely does she try to steal one of our possessions and run off with it. One of the only bad things about her, in fact, is that she invariably wakes around 5:30 and begins to whimper softly in her kennel. One of us (usually Steve) gets out of bed to take her and Tucker downstairs and out to the lower back yard. Sometimes Kyndall pees urgently or clearly has to poop. But more often, she doesn’t seem that desperate. (We try hard to cut off her access to water after 5:30 p.m., so that she doesn’t have to pee in the night.) We think instead she’s responding to the sky beginning to subtly lighten; hearing the first trills of birdsong. It’s time to get up and start LIVING! (Or so we imagine her thinking). We crawl back into bed and try to go back to sleep, usually unsuccessfully, until 6:30, when we rise to feed the beastly ones their breakfast. This is where my dream comes in. The upcoming time change will mean it will stay dark later. Kyndall won’t know anything about what the clock says! Maybe she’ll start her whimpering at 6:30 instead of 5:30! Steve points out that as the days lengthen, this slim period of grace will soon evaporate. But in another six weeks, she’ll be a older and more mature perfect puppy, no? We think we’ve never had a puppy so inclined to chase its tail as Kyndall is. Sometimes she reaches dizzying speeds and durations. Here’s one instance where I succeeded, the other day. Note how once she catches it, she kind of sits down to play with it. She’s an old-fashioned girl… running after sticks, chasing her tail. We find it charming. 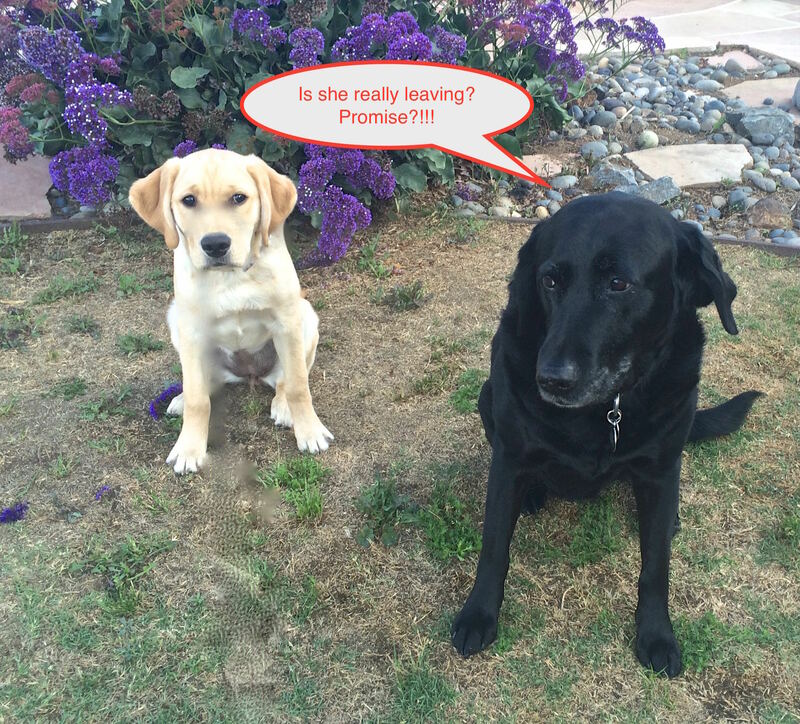 I recently posed a question about excitable greetings on the Facebook page that was started for those of us raising puppies from the same litter (the one that included Kyndall). Every dog that Steve and I have ever raised has been excessively excitable when greeting people (or other dogs. Or in some cases, any living thing.) Such greetings are annoying. Maybe some folks enjoy being jumped on by an adorable 15-pound ball of fur. But by the time that puppy weighs more than 50 pounds, it’s really annoying. Inspired by this advice, I emailed everyone in our Friday night movie group, which gathers in the condo of a friend who graciously welcomes our CCI puppies. I asked everyone to try giving Kyndall the cold shoulder the next time we gathered. Everyone cooperated, and it seemed to be astoundingly effective. Confronted with each person’s back, Kyndall just… popped down into a sit. I had to react quickly to everyone that they could turn around and reward (i.e. pet) her. It seemed like magic. We’ve been trying to continue this regime in the days since Friday. Sometimes it doesn’t work. But at other times, it looks as if Kyndall understands what we want her to do. The question that naturally arises: can we train the humans who interact with her to keep it up (including us)? Hope springs eternal. Kyndall got her first bath in Southern California on December 17, the day we picked her up from the Southwest regional headquarters. I was talking to the puppy-program director when the bathing was going on, but my friend who accompanied me that morning watched it and later told me she seemed astonishingly calm. Steve and I haven’t bathed her since. It’s been cold, and she didn’t look dirty. But the weather has been very warm for the past few days, and she’s been scratching a lot, reminding us that it’s almost time to treat her for fleas again. 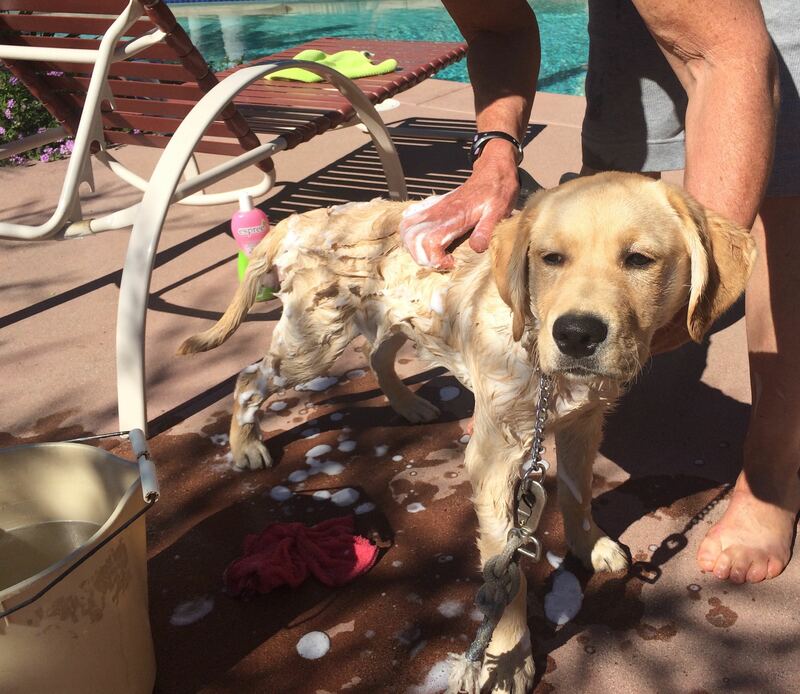 Moreover, a warm, sunny day is the perfect time to introduce a young puppy to the experience of at-home bathing. 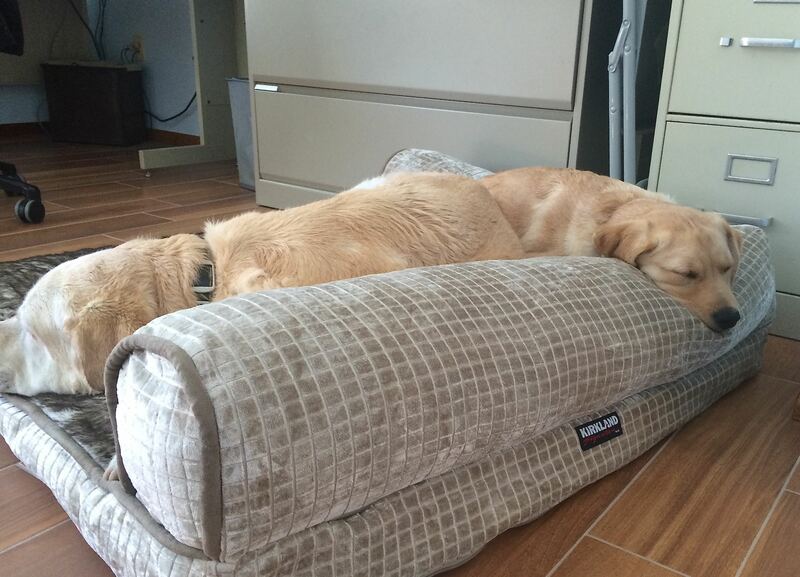 Now the two of them are racked out on the luxurious new dog bed I simply could NOT resist buying yesterday at Costco. Every princess needs to lounge on memory-foam, Kyndall assures me.